Your air conditioner has worked hard to keep you cool and comfortable throughout the summer season. Now, it is time to bring back the favor to your A/C unit with these end-of-summer air conditioning maintenance tips. Keeping your air filter clean throughout the summer is necessary but as fall comes in, having just clean filters is not enough. Replace your old filters for better performance and efficiency this fall season. Make sure to purchase the filters that fit your A/C system. Your air conditioner’s electrical connections are potential sources of fire hazard in the house. To maximize your safety while using your cooling unit, do a complete inspection of your electrical system. Check the system’s control, identify loose or damaged wires and upgrade the insulation of your wiring if needed. Dirty condenser coils can cause your A/C system to work inefficiently. If not maintained, the condensate drain line can breed mold, moisture, dust and all sorts of dirt that can damage your property. A quick assessment of the coils could save your unit and house from possible damage. Prepare your condensing unit this fall by giving it a dose of tender loving care. Eliminate any obstructions around the unit that hinder the proper air flow. Prune weeds, shrubs, and bushes near the unit. 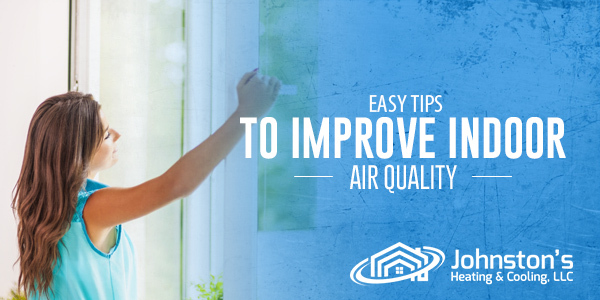 Dust off debris and dirt to allow proper air circulation throughout the system. Optimize your air conditioner to keep up the challenge this fall through a preventive maintenance service. Get your system ready for the seasons ahead with a comprehensive inspection and tune-up. Scheduling a regular A/C maintenance will keep your system energy efficient. No matter what type of air conditioning unit you are using, these simple maintenance tasks will surely keep your air conditioning system at peak performance on all seasons. Don’t settle for anything less for your HVAC system if you are after quality comfort at home. For more tips on A/C maintenance, do not hesitate to contact our specialists at Johnston’s Heating & Cooling, LLC. We pledge to offer nothing but high standard heating and cooling services suitable to your budget and comfort needs. Contact us today!